Other than the obvious—PRIVACY—why in fact do we really need to have window treatments in our home or business interiors? Window treatments are a beautiful and functional way to complete your room’s interior design. Simply put, window treatments can be the icing on the cake! (If we imagine your room is a cake…mmm.) Ahem, when we’re not thinking about dessert, window treatments can actually be used to solve architectural or lighting dilemmas in the room. A room that is too bright or too dark at certain times of the day can benefit tremendously with the right type of window treatments. For instance, if your family room or media room have west-facing windows and get lots of direct sunlight in the early evening when you are watching television, window treatments can help you solve that problem. Conversely, if your room is too dark, light and airy window treatments that provide a little privacy while also allowing lots of light to enter the room can be just the right solution. We can use window treatments to correct the echoes of a room. Echo, echo! Yes, even rooms that aren’t at the precipice of the Grand Canyon can project a harsh tone or even give off that cavernous feeling. Window treatments can be used not only to soften the volume of a space, but they can also soften the appearance of the space itself. This challenge often occurs in new homes where there are no existing window treatments or in homes that are more modern in design. We pride ourselves in being able to find just the right type of window treatments to maintain the design integrity of a room, and also to make a huge difference in creating an inviting space, called “your home”. Some examples of how window treatments can enhance a room. This room was a little tricky due to the different sized windows. There is a small sitting area in this master bedroom that was flanked by a large three pane picture window and a tall narrow window. Next to the bed is a smaller window high up on the wall. Certainly, this is a challenge given their close proximity. We chose to unify the room using matching valence styles. 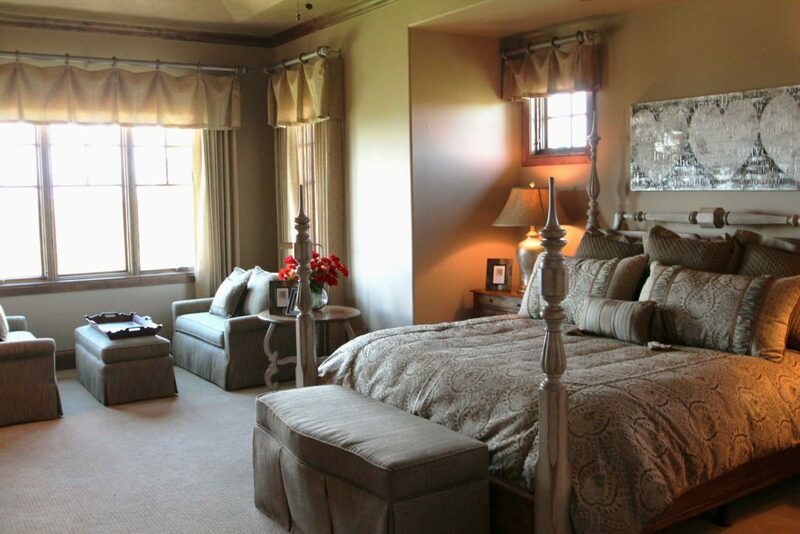 These matching valances were paired with layered shades underneath to address light and privacy concerns. Panels were added to the larger windows for romance and drama. All of it was brought together elegantly with decorative hardware. Another master bedroom that required beautiful and sophisticated window treatments, but this time they needed to be durable. This home belonged to a family with pets and children. The parents wanted a sophisticated look, with a solution that offered both privacy and a way to darken the room at nap time. 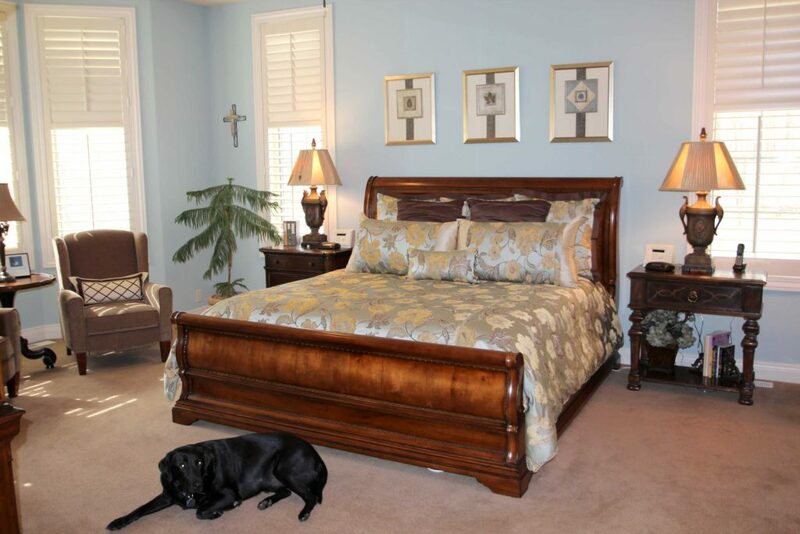 We used these plantation shutters to add a hint of Southern charm with easy light and privacy control. Decorative treatments can always be added at a later date, which we find happens many times. As interior designers, when we first saw this room we were both struck by the wall of beautiful windows and light. The last thing they and the home owners wanted to do was to cover those amazing windows with yards of fabric. The magnificent moldings, wood and stone fireplace screamed for something special. 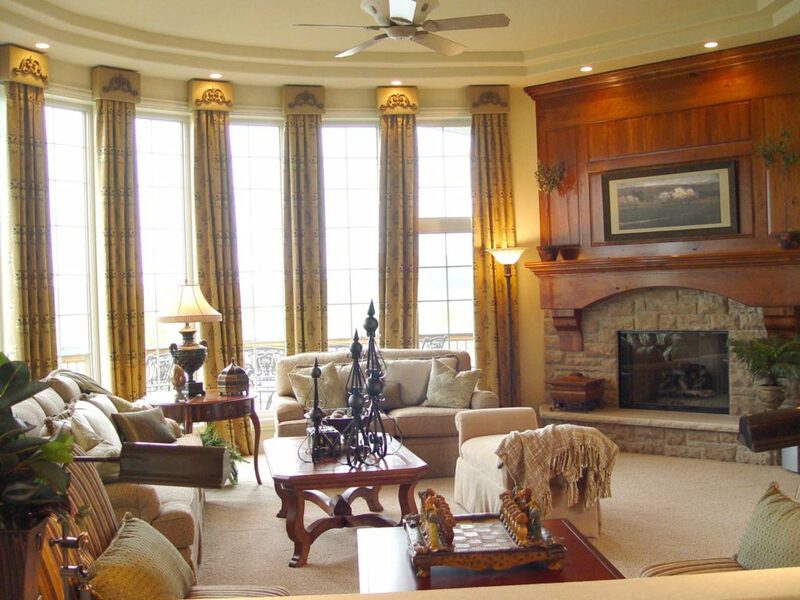 So “columns” of fabric were designed with custom-made cornices to add to and complement the dramatic architecture. We must say our clients were delighted!!! If you need help deciding what the best options are for covering or enhancing the windows in your home or office, contact us today.